Whether you are looking for stylish pieces for yourself or (yay!) for a cold weather honeymoon, be sure to consult our winter fashion trends for advice. You can go full force and incorporate many tips or just pick and choose a few of your favorites. There are so many fun options! 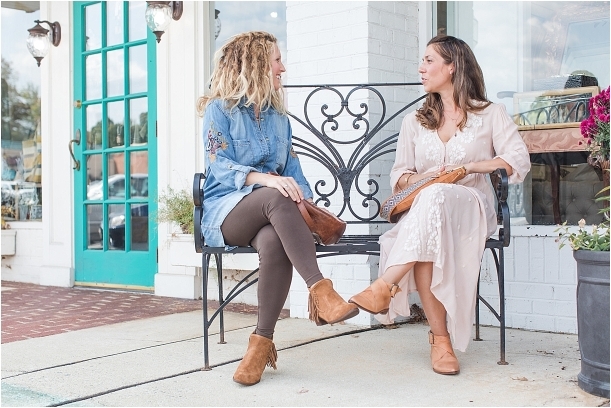 We sought out our tips from one of our favorite Lynchburg, Virginia clothing stores, Gladiola Girls. Have fun learning some of the trends! 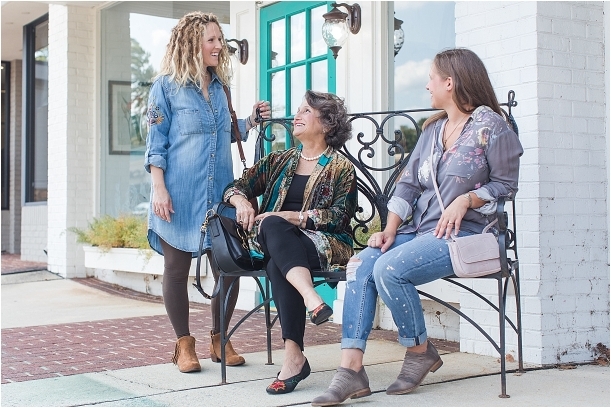 We love fashion, Lynchburg, and Gladiola, and you may see a recognizable face in these winter fashion trend photos – current Lynchburg Mayor Joan Foster. Nicki Ahrens Photography did a photo shoot with Joan and her daughters in the Boonsboro Shopping Center and also in a greenway. So pretty! 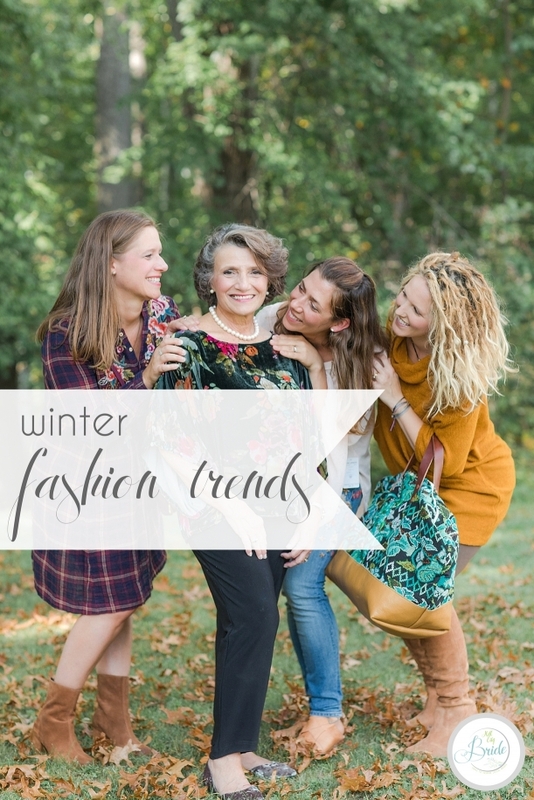 Now on to our winter fashion trends! Plaid – Whether in your scarf, handbag or shirt, this pattern makes a comeback this year. Velvet – This soft fabric does the trick for both a shimmery look and warmth. Test it out with a jacket, shirt or shoes. Booties/Boots – These staples never go out of style, so purchase wisely for seasons of use. Embroidery – Adding a handmade touch to denim, dresses and more, sewn fine detailing is beautiful. Distressed Jeans – Not to be overdone, just the right touch of distressing adds interest to a basic pair of blues. Shirtdress – An elongated silhouette, the shirtdress can be worn for both casual and business uses. Exaggerated Sleeves – If you crave extra fabric, the place to go is with flowing sleeves on dresses, tops or sweaters. Body Flattering Styles – Show off your figure without committing to tight styles, so choose shapes that work with the body you have. Conscious Purchases – Your American dollars can do good in other countries. Many businesses are empowering women around the globe with fair trade and friendly purchases. Such a lovely group of ladies! If you are looking for more fashion inspiration (this time it’s summer!) just check here. Laura Dove - Wow what gorgeous outfits you all have! I love that denim shirt, it looks so pretty! Really gorgeous photos! Iya - Louisa - These photos are gorgeous! Its nice to see such beautiful clothing on “normal” people. It makes you actually want to buy the clothes. Samantha Donnelly - I am loving the outfits, especially the denim shirt as you really can not go wrong with an item of clothing like this and something every wardrobe needs. Chris - Glad to see summer’s around the corner and to get a preview of what’s waiting for us. I love the shirtdress especially! Jocelyn @ Hip Mama's Place - This is such a lovely photo shoot. I enjoyed looking at the pictures! The clothes are beautiful as well, I love a good shirt dress. LeeAnn - Looks like they all had such a fun time and they ALL look amazing! And I love the outfits! Lyosha Varezhkina (@lyoshathegirl) - Very lovely trends indeed! So cute. But it’s not suitable for winter I live in. I wish these were ‘my’ trends! Akamatra - These girls and their mom look awesome in this photoshoot! I love their natural smiles, they give away the sense of love their family has! Lovely outfits as well! Elle (Cleverly Changing) - My favorite look was the mother of the bride. Everything she wore was effortlessly beautiful. The photos were so clear and elegant. London Mumma - I love this whole family look and how they are all sync. a really beautiful family. August Pfizenmayer - My favorite looks were the plaid and the velvet! I really need to give my wardrobe some life. I’ve been depressed lately. Nina - I really like that light pink shirt dress! So very pretty and boho! I also love the plaid trend. I have a plaid shirt dress that I absolutely love! Chelsea - Oh I love the mustard/ochre jumper. I’m really liking that colour at the minute and think it’s great for Autumn and winter. I’m currently planning my spring and summer wardrobe though. Adam Townsend - Some lovely outfits shown here that’ll be nice to consider buying the other half! Yellow is my favourite colour, love the mustard top.